I love Peking duck and my version of Christmas duck is a simple way to achieve that wonderful crispy skin. All you need is patience, a bicycle pump, and a piece of string to separate the skin from the fat. If you want to brine the duck with some spices before preparing and roasting it, you can brine it overnight. When you’re browning the duck, avoid browning the breast too much in the pan, it will cook in the oven to a perfect medium rare in about 16 minutes. If you want to cook it longer, you can. Preheat oven to 500 degrees Fahrenheit, using the convection setting if available. Set the duck on a board. Tuck the wings under the back. Tie the neck tightly with string. To release the skin from the duck, insert the end of a bicycle pump that has been wrapped in plastic wrap into the cavity of the duck, create a tight seal with your hands, and pump air into the duck to release the skin from the fat. Once all of the skin has separated from the fat, remove the pump and remove the string from the neck. Cut off the neck and remove the skin. Cut off the pope’s nose and any extra skin and fat from the tail end. Set aside. Season the duck with salt and pepper inside and out. Using a sharp needle prick the skin all over. Truss the legs with string, and let the duck come to room temperature, about 30 minutes, before proceeding. Cut one of the oranges into 6 segments and drop the pieces into the duck cavity. Using the back of a knife, bruise the thyme to release the fragrant oils and insert the thyme into the duck cavity. Slice the whole head of garlic in half horizontally. Heat a heavy cast iron pan over high heat. Add the reserved duck fat, neck and pope’s nose; render off the fat. Add the garlic, cut side down. Add the duck, starting with the breast side up, and brown it all over, turning as each side becomes brown and some of the fat renders. Add the second bunch of thyme to the pan; cut one orange in half and add to the pan. Baste the duck with the rendered fat making sure to spoon some of the hot fat into the cavity. Arrange the duck, breast side down in the pan and transfer to the oven. Roast for about 14 minutes, or until golden. Remove the duck from the oven and turn the duck breast side up. Spoon 4 tablespoons of the rendered fat from the duck into a second cast iron pan. Return the duck to the oven and roast for 2 to 4 minutes, until the skin dries out a bit and becomes crispy. Remove from the oven and let rest for 15 – 30 minutes. Heat the rendered duck fat in the second cast iron pan over medium heat and add the endive. Cook, turning the endive until it is wilted, about 3 minutes. Cut the second orange into six segments and add to the pan with the endive. Continue cooking until the orange segments are golden and caramelized, about 3 minutes. Add the tarragon leaves and toss together. Pour the duck sauce (recipe below) over the endive and heat through. 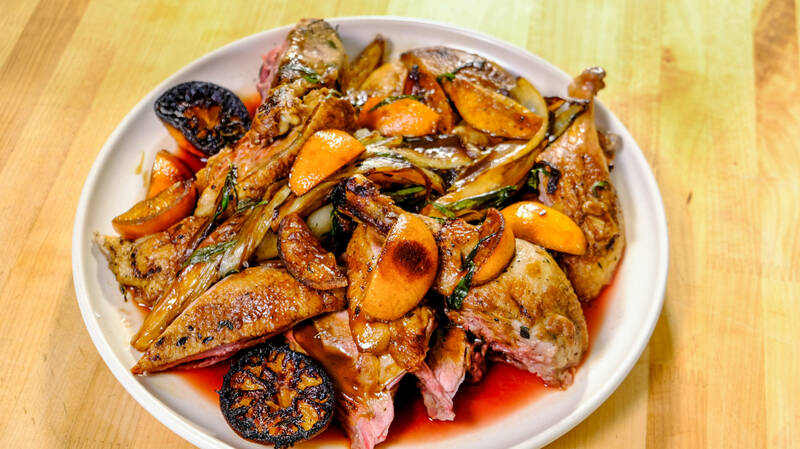 To serve: Remove the cooked orange segments and thyme from duck cavity. Carve the duck and arrange on a large platter. Arrange the endive, orange segments and sauce around the duck. Serve immediately. 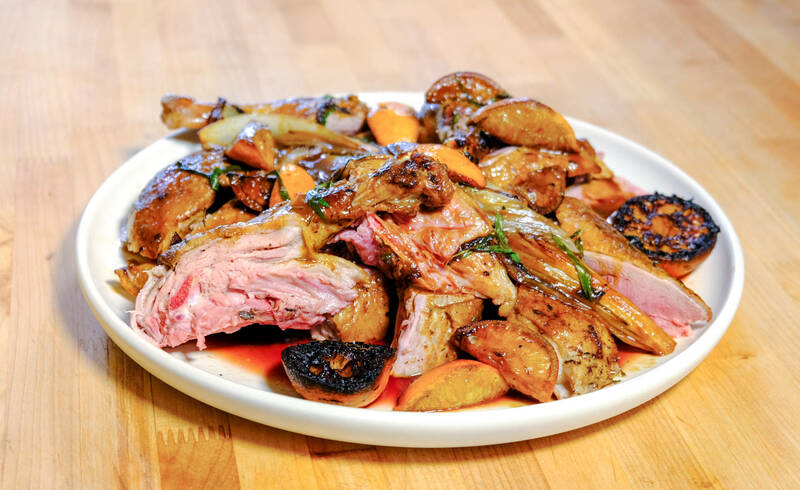 In a large pan, combine the duck wings and backs, stock, onion, celery, carrot, orange peel, juniper, and coriander; bring to a boil. Reduce the heat and simmer for 6 hours. Strain the stock through a fine sieve into a saucepan. Skim off any fat from the surface of the stock. Return the stock to a simmer, and cook gently until it is reduced to about 2 cups.